Set a couple of “mini-goals” last week, involving mileage and stride rate. Worked out pretty well. Didn’t adjust mileage on the plan overall, but I did go upwards (to 60) last week. A personal best for me. The goal for stride rate this week was to improve to 175 bpm from 166. In the end, I averaged 174. Nice improvement from the previous week, and it took some concentration on what I was doing with my feet at various points during the week. The better news is that my stride rate picked up naturally as well. As in, I didn’t really have to think about it towards the end of the week. Like to get that rate to 180 this week. Suppose you always have time for the things you care about, right? After three weeks of tough, high heat/humidity runs in Dallas (70+ degrees with 70+ percent humidity), everything came together in San Diego. Much less humid, perfect temps in the mornings. Closed out with one final effort in Hawaii after my flight arrived on Saturday. First of many miles to come here, I suppose. And there we have it. This 16-week plan was to have runs in five states: Indiana, Arkansas, Texas, California, and Hawaii. And it’s all done in week 6. Great feeling. Meb was at a local event in San Diego hosted by Jim Ryun to commemorate Ryun’s sub-4:00 high school mile. Got a picture with Meb as well. Felt bad for him because we all swarmed him on the field to get one. Appreciate him taking the time to promote the sport. Lots of other talents and legends there as well: Eric Avila, AJ Acosta, Sarah Brown, Deena Kastor, Mary Slaney, Jearl Miles Clark, Joaquim Cruz. Fortunate to go there with a friend and a lady who turned out to be a baller in the world of USA Track and Field. Knew EVERYBODY…she did. Made it easy for me to meet people. Pretty…effin’…cool. And inspiring. Great effort last week. Need to keep pouring it on here. Will begin the new job this week. And trying to get used to the decent running routes here. That is, those without lots of tourists who don’t want to be run over. Approaching something that feels like me being in great shape to run. I don’t think I’ll be in personal best shape until these runs start approaching the 8:00-mile mark. Plus, the speedwork would have to improve considerably. I was running repeats at near 5:30 pace when I PR’d three years ago. So far this time around, I haven’t planned to run much faster than 7:00 on the repeats. 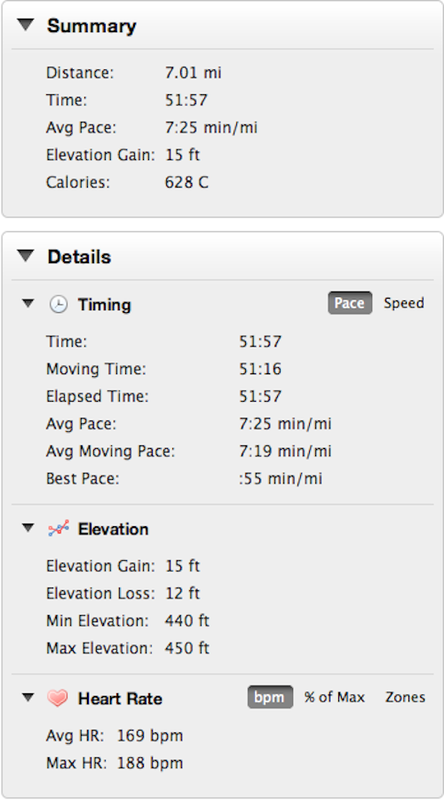 That said, the long easy runs are making my shorter speedwork feel really easy. Closed in 6:16 on the repeats on Wednesday – just out of curiosity. Maybe I won’t have to run all that fast in practice on speed days to reap the benefits. We’ll see. Making progress. I’ll take it. (1) I’m going to have to adjust my mileage upward. I planned to hit between 10-12 hours/week based off an estimated 11:00-mile pace at 75% heart rate for most of my easy runs. The problem is that I’m averaging around 9:30 per mile at 75% heart rate, so I’m cheating myself out of overall running time. Case in point: this week I completed 58 miles in 9 hours, 10 minutes. Have to do some math, but I’d like to get back to the 10-12 hour range I’d set out for myself at the beginning. (2) Run cadence. Bought a Garmin footpad before I left Indianapolis, and I really haven’t been using it well. At some point today I remembered to check my stride frequency during my long run on Saturday. The real challenge is increasing turnover without increasing heart rate above 75% on the easy runs. If I’m going to improve overall – for fast or slow runs – my turnover has to improve as well…to the point where I’m more comfortable. Elites average between 180-200 strides per minutes (spm). Last week I averaged 166. Next week, I’d like average 175. So there you have it. More mileage. More strides. Whew. This was the last full week in Texas. I won’t miss the humidity, but I will miss home. Next week, I run in three states: Texas (Sunday), California (Monday-Friday), and Hawaii (Saturday). It’s going to be a huge challenge to get the mileage in with two flights, a convention and in sum…a move. That said, I do feel fortunate to have the opportunity to travel and work. I’ve certainly been without either for extended periods of time. As I said, last week, I’ll do my best to get the mileage in. Helps to keep this blog to stay accountable. That’s it for Indianapolis. 11-miler at 5 a.m. to close it out because Dad and I are going to hit the road to Texas in a minute here. Been a challenge running in the Midwest in the winter and early “Spring”, but mornings like today make it all worthwhile. 59 degrees, breezy and no one on the roads. Lots of mileage (by my standards) this week, and it was for the most part…fun. Running’s a great way to start the day and relieve the tension at the end the day as well. Time to wash up, pack up and drive off. When I last left off, I was getting set to run a race in Columbus at the end of April. Two foot “injuries” later, I’m now starting another schedule for the summer. Not going to say January-April was a failure though. Gained a lot of strength in the weight room and on the track in those months. Probably packed on about 5-7 pounds in the process. That said, the weather’s getting better. It’s time to do what I really love doing. Just run. Moving to Hawaii sometime this summer for work. I am vaguely aware of what that sounds like. Just reporting the facts here. Move involves stops in five states: Indiana, Missouri, Texas, California, and of course Hawaii. Not much room to hit the weights and the track on the road. So, I’m keeping it simple. Mileage. 10-12 hours per week. Morning and and night. No more than an hour at a time. Easy work. The old Lydiard way. Long runs on the weekends. Tempo and “speedwork” outside on Wednesday. I just want to be outside. Hit 70 miles in a week in late July-August. Avoid injury, particularly of the foot and knee variety. Increase pace on easy runs, gradually. Run increasingly faster in four 5K races. Workout: Warm [2.5 mi. ], 3 miles @ 6:17 pace, Cool [2.5 mi. ], Drills Weather: 72 degrees, cloudy. For whatever reason today’s workout was hard. Maybe it’s because tempo running is supposed to be hard. After about a mile, the workout felt like an all-out race. There were times when I was able to stride out and convince myself that maybe this pace was something I could hold for a long time. After all, there are marathoners moving at my tempo speed. In the end, there was no relaxing. Just all out effort. 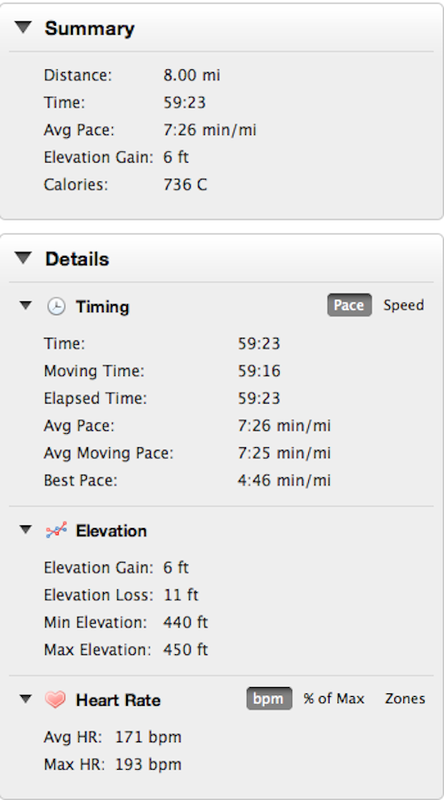 I finished at a 6:13 pace for the tempo portion – mainly because I was trying to get this workout over with. The best tempo run of the season, but not necessarily confidence inspiring when I’m planning to run a race 40 seconds faster per mile. My goal is to rely a little more on training and adaptation and less on character and toughness. When similar workouts feel easier from week to week, I take that as a sign of improvement. With that said, I’m happy to have finished the run today because it’s definitely one I could have seen myself quitting. Having a blog was useful as well because I wasn’t prepared to tell a losing story today. Oddly enough over the course of this training plan, it’s the long runs that have been my better runs and not the shorter tempo and speedwork sessions. At least lately. I can be confident that with adequate carbohydrate intake that I will complete any long run that I have planned. But the tempo runs and the speedwork are a bit of a turkey shoot. I just go outside and give it my best. Whatever happens…happens. On a positive note, I have to remember that my weekly mileage is more twice what it was when I started this plan. Of course speed is going to suffer. Just have to hammer through these workouts and hope that the taper week will save me.